The Oracle Apex shuttle item is a neat way to select a number of values. It is however not so user friendly when the list of choices is very long. In this case it is useful to be able to limit the list of choices. When you implement the limitation in the LOV-query of the item, the limitation will also be applied to the selected values. Usually this is not the desired behavior. 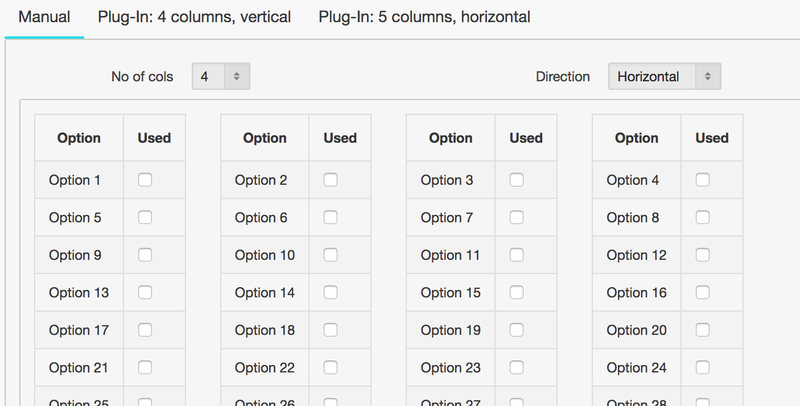 The plugin attributes are the shuttle item and the select item. 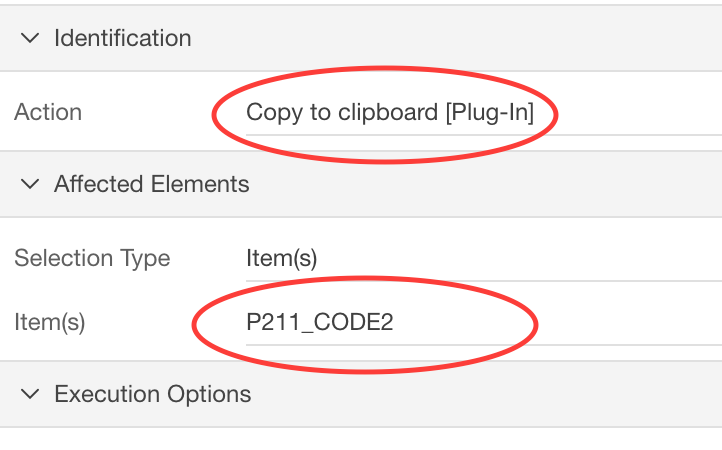 The plugin needs to know the select item to disable submit when enter is pressed. You can put this code on the page or include it in a general JS file. The show timing calls display the elapsed time since the last call to start_timing. One of the things that cost me a lot of time is the writing of log statements. and most of the time the variable names are even longer :-(. There is an option to generate mulitple calls or combine all variables in one call. The location is determined from the IP address. This is done in a Dynamic Action that calls a web service at ipapi.co to retrieve the geographical location from the IP address and then stores the result into an Oracle table for subsequent usage. NB The apex_activity_log is limited in size and the older entries are regularly deleted. Therefore the content of the log is daily copied to a another table. This table is used for the report and the map. I like to see that the visitors come from all over the world, not only from Europe, North America and Asia, but also from Middle and South America and Africa. It is good to see that Apex is used all over the globe! But the list does not give me an overview of the geographical locations. 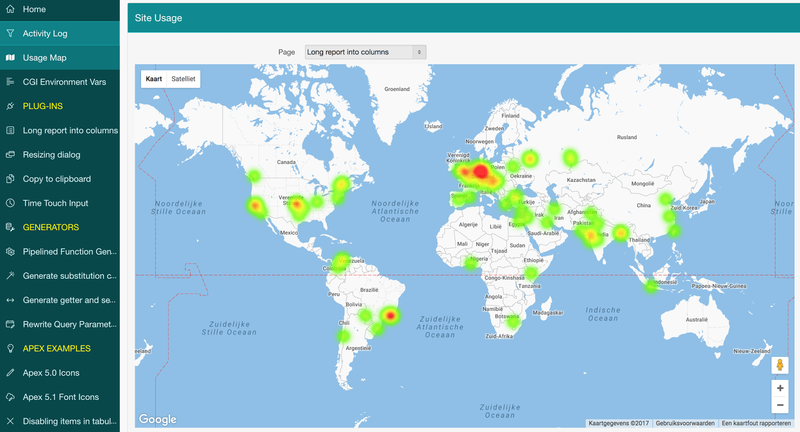 So I looked for a way to visualize this data and came across the GeoHeatMap plugin by Jeffrey Kemp. It is very easy to implement and just requires a query retrieving latitude, longitude and weight. You can get a clear view of where the visitors come from. In the normal mode the light green color is hardly visible against the predominantly green color of the maps. By setting the plugin attribute Map Style to mostly gray, found at https://snazzymaps.com/style/4183/mostly-grayscale, you get the quiet background with sufficient contrast. 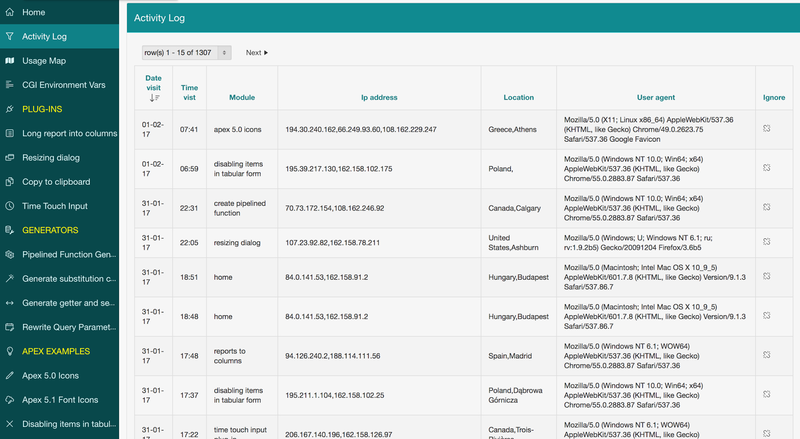 It is possible to see the geographical distribution per page by changing the Page select list. There is clear difference in distribution for the various pages of the application. Starting in Apex I used bind variables to reference the input items. Then I move the query to a package and I had to rewrite the bind variables to calls of the Apex v function. Now this is just a short query with just one parameter. 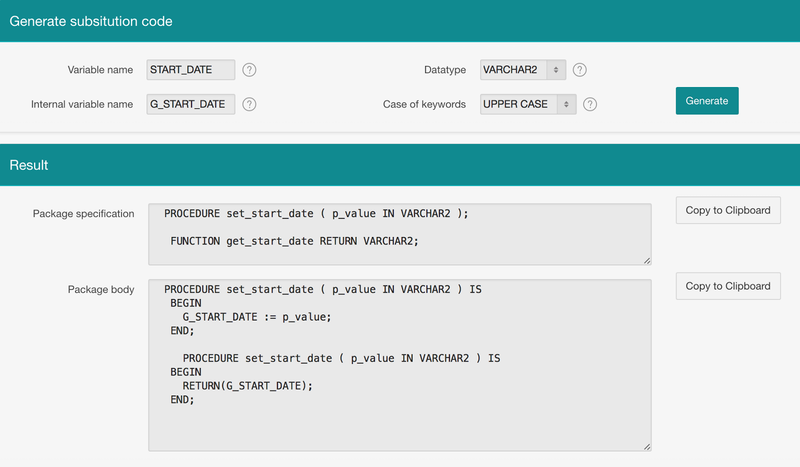 But it is a lot of work for queries with 20+ lines with 5+ parameters. And then it takes time to convert the parameters. And I make mistakes, I forget to change a parameter or I make a typo. Most of the time I find the error quite fast but sometimes it is not so obvious. On the page you can paste your query. If possible the source parameter type is recognized. You can indicate to what type of parameters are the target of the conversion. Further you need to specify the delimiters for the substitution variables or the prefixes for PL/SQL and Apex ( for bind variables and v-function). Then hit Generate, clip the code and use it. For me most of the time I can use the code without modification. Building applications with Apex I am coding in PL/SQL a lot. I find myself typing in similar patterns many times. And I do not like it. Being an IT man I look for ways to automate it. One of the things I regularly have to create is getters and setters for package variables. I start out with a package and define a package variable. Then after a while it turns out I need this value in a SQL statement. So I need a getter. It is more elegant to use getters and setters anyway. It is very simple and fast to use. Just type (or paste 😉 ) the name of the variable, chose the datatype and hit the generate button. 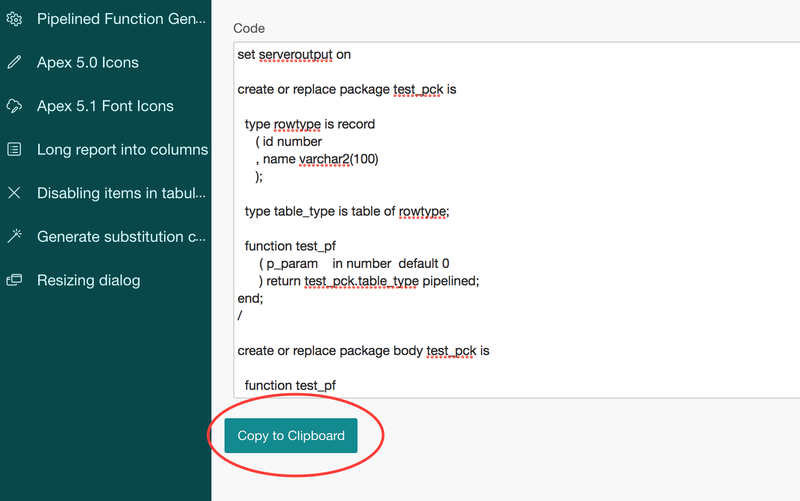 Then hit Copy to Clipboard and paste the result in your PL/SQL package specification and body code respectively. – Internal variable name: use it if the internal variable name differs from the one you want to expose in the interface. The case of this name is not affected by the Case switch. This control is now available as an Apex dynamic action plug-in. You can find it at the plug-in section of apex.world. The analog displays a 12 hour period, while the day consists of 24 hours. This is tackled by the AM/PM indicator. It is however not very user friendly if you have to press the PM button each time you want to enter a time after noon. Therefore the concept of a time window is introduced. In many cases your application will accept times in a certain ranges. For working hours registration this might be between 7:00 and 19:00. It is possible to interpret the chosen times to that specific period. So hour=8 will yield 8:00 and hour=5 will result in 17:00. In this example the time window is from 7:00 to 19:00 and the time window base is 7. The time window base can be set as component level attribute. The user can overrule this setting by using the AM or PM buttons. So if the user enter hours=5 and presses the button AM, the resulting time will be 5:00. I would really like to hear whether you think this control useful. Or maybe you have suggestions on improving it. It is a hobby of mine to generate code. I use Apex as a shell to enter the parameters and display the result. Usually the result is a text area in which the code is contained. After generating the text I can select the code and copy the result to the clipboard. But I want it to be a bit more comfortable. You can see this plug-in in action on the demo page for this plug-in. You can find the plug-in on apex.world. So here is my first (public) plug-in, Report2columns.